How to lose weight effectively? Do diets really work and what about exercise? In order to find out, 180 participants were assigned to one of 3 diets and one of 3 exercise levels. After two months, participants were asked how many kilos they had lost. These data -partly shown above- are in weightloss.sav. 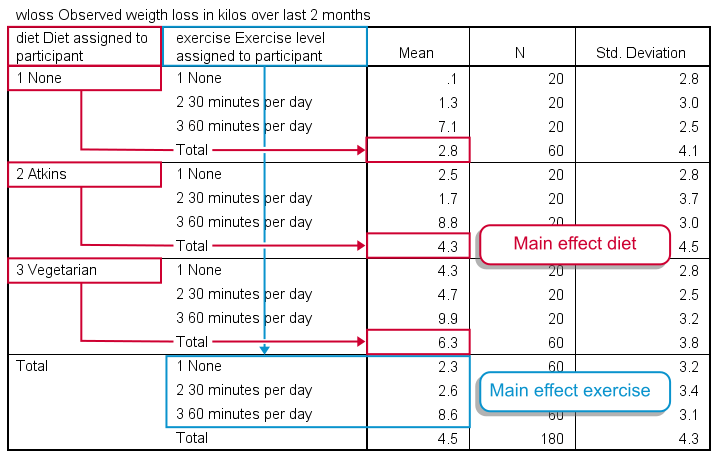 We're going to test if the means for weight loss after two months are the same for diet, exercise level and each combination of a diet with an exercise level. That is, we'll compare more than two means so we end up with some kind of ANOVA. We always want to have a basic idea what our data look like before jumping into any analyses. We first want to confirm that we really do have 180 cases. Next, we'd like to inspect the frequency distribution for weight loss with a histogram. We'll do so by running the syntax below. *Inspect how many cases we have. *Inspect histogram for weight loss. /format notable /*= don't create table because it's too large. We have 180 cases indeed. Importantly, the histogram of weight loss looks plausible. We don't see any very high or low values that we should set as user missing values. One or two participants gained some 7 kilos (weight loss = -7) and some managed to lose up to 15 kilos. Furthermore, weight loss looks reasonably normally distributed. We now like to know how participants are distributed over diet and exercise. For our ANOVA, later on, we need to know if our design is balanced: are the percentages of participants in each diet equal over exercise levels? Some of you may notice that this question is actually the null hypothesis in a chi-square test. And that's exactly what we'll run next. *See how participants are distributed over diet * exercise groups. Note that each cell (combination of diet and exercise level) holds 20 participants. Note that our chi-square value is 0 (not shown in screenshot). This implies that we're dealing with a balanced design, which is a good thing because unbalanced designs somewhat complicate a two-way ANOVA. So did the diet and exercise have any effect? A very simple way for getting an idea of this is running a basic MEANS table. *Inspect means for diet, exercise and diet by exercise. means wloss by diet by exercise. It may take a minute to see the pattern in this table but I did my best to highlight it with colors. Note that participants without any diet -all exercise levels taken together- lost an average of 2.8 kilos. The Atkins and vegetarian diets resulted in 6.3 and 4.3 kilos of weight loss on average. This is the main effect for diet: the differences in weight loss attributable to diet while taking together all exercise levels. In a similar vein, we see a somewhat stronger main effect for exercise with means running from 2.3 up to 8.6 kilos. An interesting question is whether the effect of exercise depends on the diet followed. This is what we call an interaction effect. We'll explain it in a minute by visualizing our means in a chart. We just saw that different diets and exercise levels show different mean weight losses. However, we're looking at just a tiny sample. The situation in the (much larger) population may be different. Is it credible that we find these differences if neither diet nor exercise has any effect whatsoever in our population? We'll answer this question by running a two way ANOVA. independent observations: this often means that each case (row of data values) must represent a separate person (or other “object”). It's not allowed for a single person to appear as more than one case, which holds for our data. homoscedasticity: the standard deviation of our dependent variable (weight loss) must be equal for each (diet/exercise) group of respondents. Our previous means table shows that they are pretty similar indeed. Nevertheless, we'll also test this assumption more formally with Levene's test which is included in SPSS ANOVA procedure. a normally distributed dependent variable in the population. Our previous histogram suggests this holds for our data. On top of that, the normality assumption is of minor importance for larger sample sizes due to the central limit theorem. We choose Univariate whenever we analyze just one dependent variable (weight loss), regardless how many independent variables (diet and exercise) we may have. Before pasting the syntax, we'll quickly jump into the subdialogs , and for adjusting some settings. Estimates of effect size will add partial eta squared in our output. Homogeneity tests refers to Levene’s test. It assesses whether the population variances of our dependent variable are equal over the levels of our factors. This assumption is required for ANOVA. Profile plots visualize means for each combination of factors. As we'll see in a minute, this gives a lot of insight into how our factors relate to our dependent variable and -possibly- interact while doing so. A basic ANOVA only tests the null hypothesis that all means are equal. If this is unlikely, then we'll usually want to know exactly which means are not equal. The most common post hoc test for finding out is Tukey’s HSD (short for Honestly Significant Difference). Following through all steps results in the syntax below. We'll run it and discuss the results. *ANOVA with means plots, Tukey's post hoc test, Levene's test and Partial Eta Squared. Levene’s test does not reject the assumption of equal variances that's needed for our ANOVA results later on. We're good to go. Let's scroll down to the end of our output now for our profile plots first. This basically says it all. We see each line rise steeply between 30 to 60 minutes of exercise per day. Second, a vegetarian diet always resulted in more weight loss than the other diets. Both diet and exercise seem to have a main effect on weight loss. So what about our interaction effect? 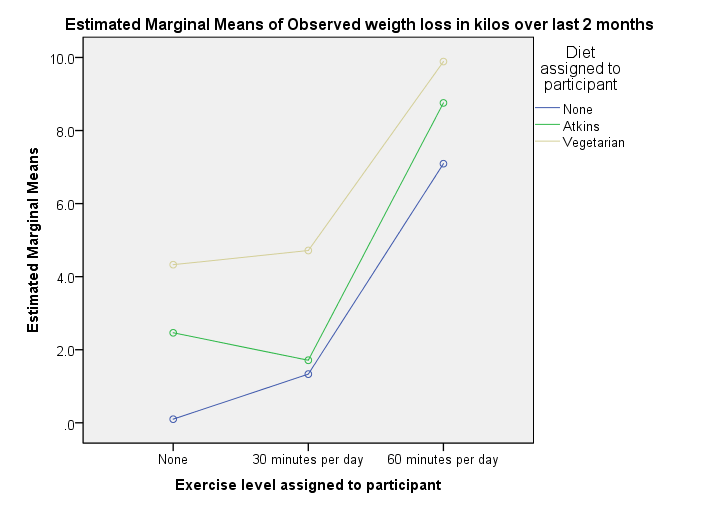 Well, the effect of exercise is visualized as a line for each diet group separately. Since these lines look pretty similar, our plot doesn't show much of an interaction effect. However, we'll try to confirm this with a more formal test in a minute. Technical note: the “estimated marginal means” are equal to the observed means in our previous means table because we tested the saturated model (consisting of all main and interaction effects as this is the default setting in UNIANOVA). Our means plot was very useful for describing the pattern of means resulting from diet and exercise in our sample. But perhaps things are different in the larger population. If neither diet nor exercise affect weight loss, could we find these sample results by mere sampling fluctuation? Short answer: no. In Tests of Between-Subjects Effects, we're interested in 3 rows: our 2 main effects (diet and exercise) and 1 interaction effect (diet * exercise). We usually ignore the other rows such as “Corrected Model” and “Intercept”. First the interaction: if the effect of exercise is the same for all diets, then there's a 0.44 probability (significance level under “Sig” for “significance”) of finding our sample results. We usually report our df (“degrees of freedom”), F-value and p-value for each of our 3 effects separately: “An interaction between diet and exercise could not be demonstrated, F(4,171) = .94, p = 0.44.” Further note that partial eta squared is only 0.021 for our interaction effect. This is basically negligible. If and only if there's no interaction effect, we'll look into the main effects, both of which have p = 0.000: if there's no main effects in our larger population, the probability of finding these sample main effects is basically zero. Partial eta squared is 0.51 for exercise and 0.20 for diet. That is, the relative impact of exerice is more than twice as strong as diet. Last but not least, adjusted r squared tells us that 54.4% of the variance in weight loss is attributable to diet and exercise. In social sciences research, this is a high value, indicating strong relationships between our factors and weight loss. We now know that the average weight loss is not equal for all different diets and exercise levels. So precisely which means are different? We can figure that out with post hoc tests, the most common of which is Tukey’s HSD, the output of which is shown below. For 3 means, 3 comparisons are made (a-b, b-c and a-c). Each is reported twice in this table, resulting in 6 rows. The difference in weight loss between no exercise and 30 minutes is 0.29 kilos. If it is zero in our larger populations, there's an 85.2% probability of finding this in our sample. Our results don't demonstrate any effect of 30 minutes of exercise as compared to no exercise. The difference between no exercise and 60 minutes is a whopping 6.28 kilos. Both the asterisk (*), confidence interval and p-value show that the difference is statistically significant. A similar table for diet appears in the output but we'll leave it as an exercise to the reader to interpret it. So that's about it. I hope you were able to follow the lines of thought in this tutorial and that they make some sense to you. Very good information, although i'm not quite here yet, I can study it and get familiar with some of the terms. I'd say those sample sizes qualify as "reasonably equal" so you don't require homogeneity. You can skip Levene's test altogether and interpret the ANOVA results with confidence. P.s. since your sample sizes are reasonably large, you don't need normality either due to the central limit theorem. I have a quick question. My sample sizes are somewhat unequal (60,53,47,57) but the levene's test stated that the variances are equal. Can I interpret the results?